So we are finally all back together here in the land of HOT. I mean it feels like the surface of the sun outside. I have grown up in California and have lived here all of my life, but give me one good summer in Minnesota and I suddenly am a hot weather wimp (Ok ok so I’ve always been a wimp). Me and my air conditioning unit are already longing for a nice mid-70’s with a cool wind. Well a girl can dream can’t I? Besides the absurd how-can-humans-survive-this? weather, Music Man and I are completely overwhelmed with LIFE here. Kids. Chaos. Clutter. Homeschool. Insanity. You see, when you introduce small humans to a whole house full of toys that they haven’t played with for months, they will immediately destroy any work that you had previously done to maintain a clean environment. They will laugh in your face at your attempts of cleanliness. Its like Christmas morning and they have been given free reign. Their little minds are BLOWN. And then you will cry. Or at least take huge deep breaths and repeatedly say to yourself “don’t cry, don’t cry, don’t cry” like I did. (Hey I did better than last year where I really did cry. And cry HARD) Because in a mere 0.002 seconds the house will look like an actual atomic bomb has exploded in your living room. If I weren’t so shocked and saddened by this affair, I would be astounded at the level of destruction these munchkins can make in the short amount of time. Really its amazing. Well part of the reason we decided to skedaddle out of our cozy midwestern town and head back to the land of daddy’s-who-must-work is because we had decided to have Ariel join in Monday school through our local church. Our church has a brick and mortar school with a homeschooling option. For homeschoolers, you can come to Monday school for fun classes (and sometimes not just on Mondays), and also enjoy sports, drama, music, field trips and other fun things that only a ‘real’ school can give (or a really good co-op). I think its a wonderful option for homeschoolers. 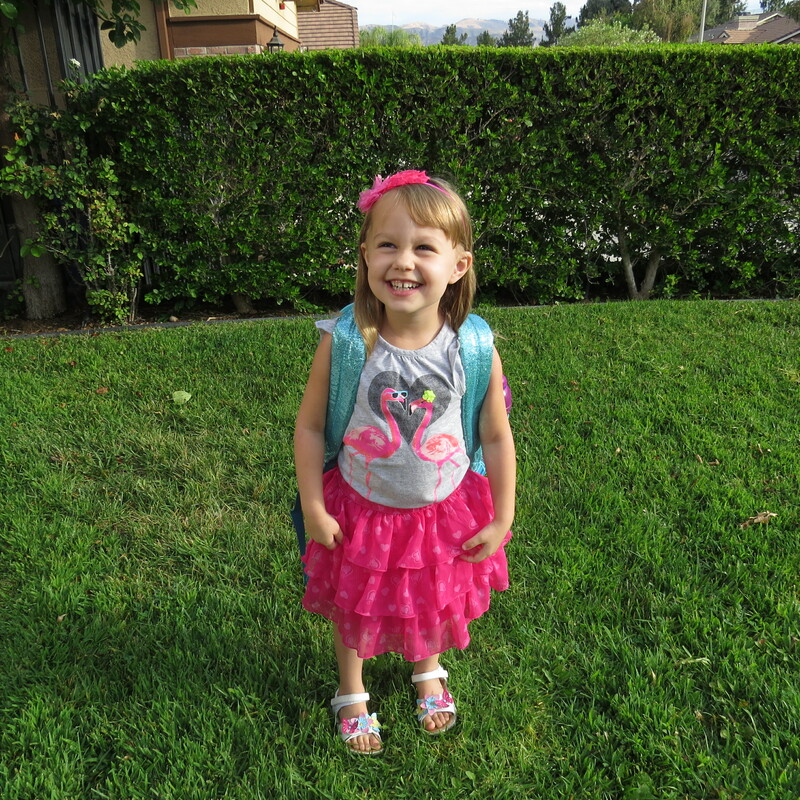 I really pumped up my sweet little 5 year old gearing her up for her first 1/2 day of drop off school. She was so excited! 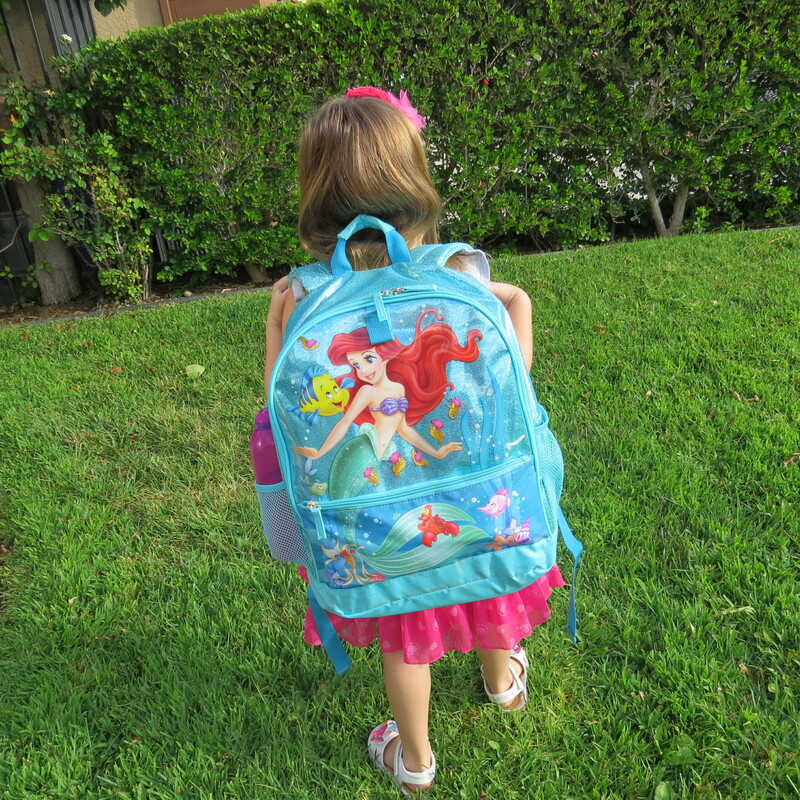 Of course she had an Ariel backpack! And for the second time in two days I had to repeat “Don’t cry. Don’t cry. Don’t cry” to myself. Thank goodness Ariel is good-natured and didn’t quite catch on why the other kids were leaving to go into their classes and she was still stuck with me. The administrators were kind and accommodating and are allowing my precocious daughter into any 1st grade classes we would like to participate in. All we have to do is figure out what we wold like to participate in. There are other co-ops or do nothing but actual at home homeschooling only. And now I am struggling as to where to place my feet. Which road do I follow? Basically God laughed at my plans. “1st Day of Kindergarten. I want to be a Princess… SO I DON’T HAVE TO HAVE ANY JOBS”.